First openly gay Lexington council member sees common ground on issues - Rockbridge Report Dennis Ayers earned the second most votes on Tuesday night for a seat on the Lexington City Council. He said he wants to focus on infrastructure while in office. For Dennis Ayers, the most intriguing part about being the first openly gay elected official in Lexington is that it doesn’t seem to matter. But Ayers, who took second of four City Council candidates for three seats on Tuesday with 1,278 votes, still sees benefits for those who may feel more welcome in a community he represents. “I’m glad to have that out of the way so that the next person who runs won’t be the first,” Ayers said. Ayers, 53, was elected by Lexington voters alongside council incumbents David Sigler and Chuck Smith. Sigler took first with 1,349 votes and Smith took third with 1,232 votes. Both incumbents expressed excitement for Ayers’s victory. Smith said he is looking forward to a fresh perspective on council. Molly McCluer, another council challenger, came in last with 1,016 votes. Ayers said he hopes McCluer runs again in the future. 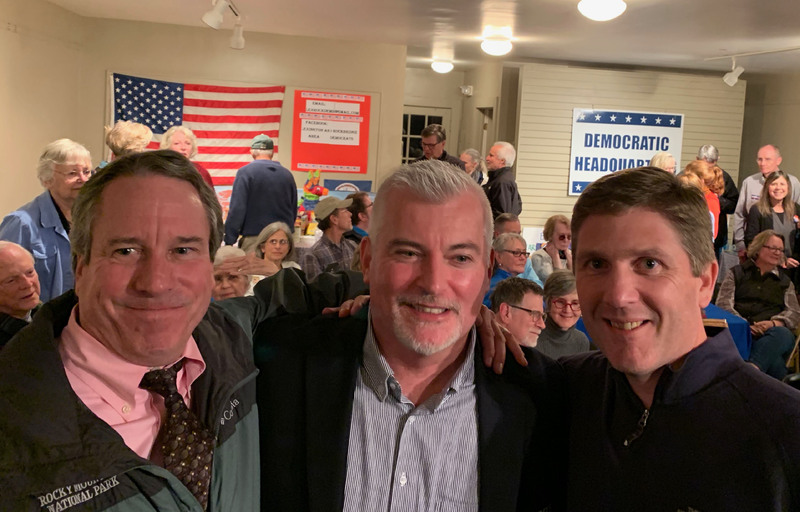 Tuesday night, Ayers celebrated his win alongside Sigler and Smith at Democratic headquarters on South Jefferson Street. Last year, Ayers ran as a Democrat for Rockbridge-Lexington Clerk of Court and had a lot of Democratic supporters. He lost to independent Michelle Trout. “It meant a lot to me that I could bring a win home for all of these people that supported me, basically for two years,” Ayers said. But Ayers also had support from his Republican colleagues at work. Ayers is a paralegal for the Rockbridge County and Lexington Commonwealth Attorney’s Office, headed by Republican Chris Billias. While Ayers does not hide his political affiliation, he does not want the nonpartisan nature of local elections to change. Sigler and Smith agreed. Ayers said fiscal responsibility is extremely important to him. He wants to focus on infrastructure, such as replacing water and sewage lines, while keeping costs down for the city. “I don’t want to see our taxes go up,” Ayers said. The city is currently replacing water distribution lines under Main Street from Houston Street to Maiden Line, as well as under East Nelson Street and East Washington Street from Main Street to Randolph Street, according to the city website. The project should last about a year. Ayers said he wants to expand replacement projects to residential neighborhoods, a project he said has not yet been funded. Ayers said everyone on council has been “incredibly welcoming” and that he is currently getting up to speed on all council business in preparation for his term start in January. He has traded five emails with City Manager Noah Simon on items such as a draft of the strategic plan since his election shortly before 8 p.m. Tuesday night. “It’s almost a full-time job,” Ayers said.